A number of entities, other than lymphomas and metastatic tumors, cause enlargement of the cervical lymph nodes. In a series of articles, we will discuss some of these entities, starting with toxoplasmosis. Lymphadenitis is the most common clinical form of the disease, [1, 2, 3, 4] with 3-7% causing clinically significant lymphadenopathy,  particularly cervical lymphadenopathy. Thus, recognition of toxoplasmosis lymphadenitis is important (see the image below for an example). The bulk of this discussion will be on the features of toxoplasmosis lymphadenopathy. 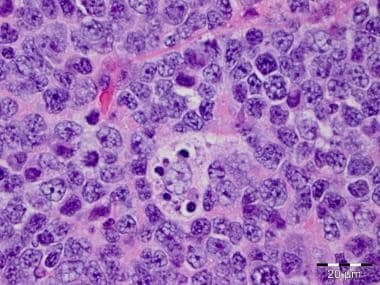 This low-power photomicrograph shows the large, irregularly shaped germinal centers and clusters of epithelioid histiocytes found in toxoplasmosis lymphadenitis. Tachyzoites emerge in a stage in the life cycle and rapidly multiply by asexual means in cells of intermediate hosts and in nonintestinal cells of the definitive host. Cells that can no longer sustain the rapidly growing tachyzoites burst. In healthy individuals, an appropriate immune response controls the rapid proliferation of the parasite. However, in another stage, by mechanisms that are not fully understood, a portion of the tachyzoites transform into the slowly proliferating bradyzoites. Eventually, the bradyzoites become surrounded by a dense wall; the resulting structure is referred to as a tissue cyst. These tissue cysts may arise in visceral organs (eg, lungs, liver, and kidneys), but they are more commonly found in neural and muscular tissues, such as the brain, eyes, and skeletal and cardiac muscle. This photomicrograph shows the "monocytoid" cells that are actually B cells. This photomicrograph shows a cluster of epithelioid histiocytes. 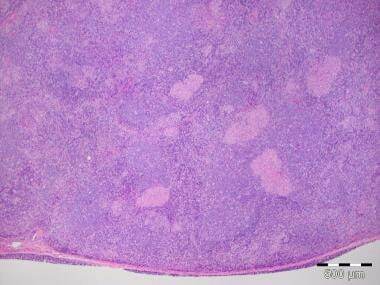 This photomicrograph shows clusters of epithelioid histiocytes within a germinal center. This photomicrograph shows karyorrhectic debris inside a germinal center. This photomicrograph shows karyorrhectic debris within a tingible body macrophage inside a germinal center. The prominent cells present in the subcapsular and trabecular sinuses were initially described as "monocytoid"  or "macrophages"  that have an abundant clear  or amphophilic  cytoplasm and large round nuclei, which are also variably described as being round to indented  or contorted. 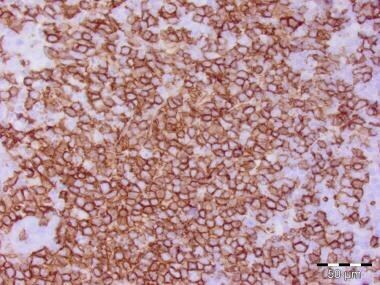 Immunohistochemical studies have demonstrated that these "monocytoid" cells are in fact B cells [24, 25] (see the following image); they are now usually referred to as monocytoid B cells. This photomicrograph shows the "monocytoid" cells stained for CD20, a specific B-cell antigen. Several other histopathologic features merit mention. Toxoplasmosis lymphadenitis has been mistaken for Hodgkin lymphoma, both the lymphocyte predominant and nodular sclerosis types, and atypical lymphoid hyperplasia. 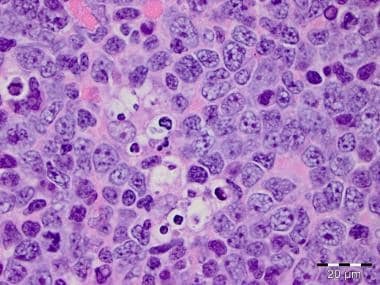 The confusion arises from the fact that clusters of epithelioid histiocytes may be present in lymph nodes involved by Hodgkin lymphoma and atypical lymphoid hyperplasia. The differential diagnosis for toxoplasmosis lymphadenitis is very large (see Differentials), because the disease has very nonspecific, if any, symptoms. 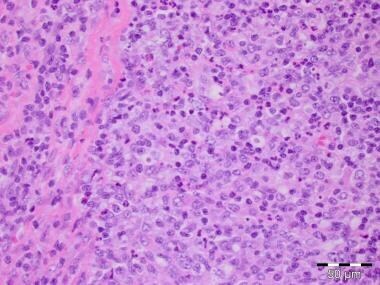 However, the diagnosis may well be suggested by the histomorphology of a biopsied lymph node. Several groups have attempted to determine the value of the toxoplasmosis triad in making the diagnosis by determining whether the results of serology studies correlate with the presence or absence of the triad. Such studies included the toxoplasma immunoglobulin (Ig) M serology, the Sabin-Feldman dye test (which determines if toxoplasma IgA, IgG, and IgM antibodies are present),  and complement fixation titers. Thus, the evidence indicates that recognition of the typical histologic features of toxoplasmosis together with appropriate serologic studies will lead to a reasonably confident diagnosis of toxoplasmosis. Reagent T gondii antibodies for use in immunohistochemistry are available, and T gondii forms have been identified with immunohistochemistry in formalin-fixed sections of lymph nodes from patients with toxoplasmosis. However, use of immunohistochemistry does not figure prominently in the literature describing toxoplasmosis lymph nodes. Indeed, in conventionally fixed and stained tissue sections, cyst forms [20, 31] and other T gondii forms [14, 15, 32] are infrequently identified. It has been suggested that the reactive changes seen in toxoplasmosis lymph nodes may be a reaction to T gondii products rather to forms of the organism itself. In any event, recognition of the classic histologic features and serology appears to render the use of immunohistochemistry in the diagnosis of toxoplasmosis lymphadenitis somewhat superfluous. Dubey JP, Jones JL. Toxoplasma gondii infection in humans and animals in the United States. Int J Parasitol. 2008 Sep. 38(11):1257-78. [Medline]. Bhopale GM. Pathogenesis of toxoplasmosis. Comp Immunol Microbiol Infect Dis. 2003 Jul. 26(4):213-22. [Medline]. Hill DE, Chirukandoth S, Dubey JP. Biology and epidemiology of Toxoplasma gondii in man and animals. Anim Health Res Rev. 2005 Jun. 6(1):41-61. [Medline]. Durlach RA, Kaufer F, Carral L, Hirt J. Toxoplasmic lymphadenitis--clinical and serologic profile. Clin Microbiol Infect. 2003 Jul. 9(7):625-31. [Medline]. John DT, Petri WA Jr. Other blood and tissue dwelling protozoa. Markell & Voge's Medical Parasitology. 9th ed. St. Louis, Mo: Saunders; 2007. 107-65. Marquardt WC, Demaree RS, Grieve RB. The extraintestinal coccidia. Parasitology Vector Biology. 2nd ed. San Diego, Calif: Academic Press; 2000. 165-86. Jones JL, Kruszon-Moran D, Wilson M, McQuillan G, Navin T, McAuley JB. Toxoplasma gondii infection in the United States: seroprevalence and risk factors. Am J Epidemiol. 2001 Aug 15. 154(4):357-65. [Medline]. Pittella JE. Pathology of CNS parasitic infections. Handb Clin Neurol. 2013. 114:65-88. [Medline]. Dubey JP, Lindsay DS, Speer CA. Structures of Toxoplasma gondii tachyzoites, bradyzoites, and sporozoites and biology and development of tissue cysts. Clin Microbiol Rev. 1998 Apr. 11(2):267-99. [Medline]. [Full Text]. Di Cristina M, Marocco D, Galizi R, Proietti C, Spaccapelo R, Crisanti A. Temporal and spatial distribution of Toxoplasma gondii differentiation into Bradyzoites and tissue cyst formation in vivo. Infect Immun. 2008 Aug. 76(8):3491-501. [Medline]. [Full Text]. Dubey JP. History of the discovery of the life cycle of Toxoplasma gondii. Int J Parasitol. 2009 Jul 1. 39(8):877-82. [Medline]. Kravetz JD, Federman DG. Toxoplasmosis in pregnancy. Am J Med. 2005 Mar. 118(3):212-6. [Medline]. Miettinen M, Saxen L, Saxen E. Lymph node toxoplasmosis. Follow-up of 237 histologically diagnosed and serologically verified cases. Acta Med Scand. 1980. 208(6):431-6. [Medline]. Gray GF Jr, Kimball AC, Kean BH. The posterior cervical lymph node in toxoplasmosis. Am J Pathol. 1972 Nov. 69(2):349-58. [Medline]. [Full Text]. Kasper LH. Toxoplasma infection. Fauci AS, Braunwald E, Isselbacher KJ, et al, eds. Harrison's Principles of Internal Medicine. 14th ed. New York, NY: McGraw-Hill; 1998. 1197-1202. Butler NJ, Furtado JM, Winthrop KL, Smith JR. Ocular toxoplasmosis II: clinical features, pathology and management. Clin Experiment Ophthalmol. 2013 Jan-Feb. 41(1):95-108. [Medline]. Sauer A, Rochet E, Lahmar I, Brunet J, Sabou M, Bourcier T, et al. The local immune response to intraocular Toxoplasma re-challenge: less pathology and better parasite control through Treg/Th1/Th2 induction. Int J Parasitol. 2013 Aug. 43(9):721-8. [Medline]. Abd El-Rehim El-Henawy A, Abdel-Razik A, Zakaria S, Elhammady D, Saudy N, Azab MS. Is toxoplasmosis a potential risk factor for liver cirrhosis?. Asian Pac J Trop Med. 2015 Oct. 8 (10):784-91. [Medline]. Stansfeld AG. 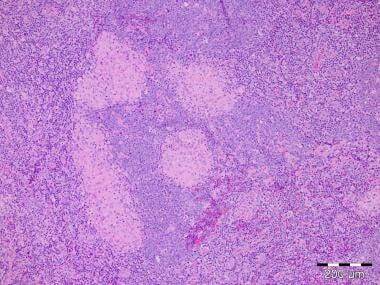 The histological diagnosis of toxoplasmic lymphadenitis. J Clin Pathol. 1961 Nov. 14(6):565-73. [Medline]. [Full Text]. Dorfman RF, Remington JS. Value of lymph-node biopsy in the diagnosis of acute acquired toxoplasmosis. N Engl J Med. 1973 Oct 25. 289(17):878-81. [Medline]. Eapen M, Mathew CF, Aravindan KP. Evidence based criteria for the histopathological diagnosis of toxoplasmic lymphadenopathy. J Clin Pathol. 2005 Nov. 58(11):1143-6. [Medline]. [Full Text]. Tuzuner N, Dogusoy G, Demirkesen C, Ozkan F, Altas K. Value of lymph node biopsy in the diagnosis of acquired toxoplasmosis. J Laryngol Otol. 1996 Apr. 110(4):348-52. [Medline]. Sheibani K, Fritz RM, Winberg CD, Burke JS, Rappaport H. "Monocytoid" cells in reactive follicular hyperplasia with and without multifocal histiocytic reactions: an immunohistochemical study of 21 cases including suspected cases of toxoplasmic lymphadenitis. Am J Clin Pathol. 1984 Apr. 81(4):453-8. [Medline]. Cardoso De Almeida P, Harris NL, Bhan AK. Characterization of immature sinus histiocytes (monocytoid cells) in reactive lymph nodes by use of monoclonal antibodies. Hum Pathol. 1984 Apr. 15(4):330-5. [Medline]. Miettinen M, Franssila K. Malignant lymphoma simulating lymph node toxoplasmosis. Histopathology. 1982 Mar. 6(2):129-40. [Medline]. Miettinen M. Histological differential diagnosis between lymph node toxoplasmosis and other benign lymph node hyperplasias. Histopathology. 1981 Mar. 5(2):205-16. [Medline]. Reiter-Owona I, Petersen E, Joynson D, et al. The past and present role of the Sabin-Feldman dye test in the serodiagnosis of toxoplasmosis. Bull World Health Organ. 1999. 77(11):929-35. [Medline]. [Full Text]. Lin MH, Kuo TT. Specificity of the histopathological triad for the diagnosis of toxoplasmic lymphadenitis: polymerase chain reaction study. Pathol Int. 2001 Aug. 51(8):619-23. [Medline]. Matossian RM, Nassar VH, Basmadji A. Direct immunofluorescence in the diagnosis of toxoplasmic lymphadenitis. J Clin Pathol. 1977 Sep. 30(9):847-50. [Medline]. [Full Text]. Aisner SC, Aisner J, Moravec C, Arnett EN. Acquired toxoplasmic lymphadenitis with demonstration of the cyst form. Am J Clin Pathol. 1983 Jan. 79(1):125-7. [Medline]. Jautzke G, Sell M, Thalmann U, et al. Extracerebral toxoplasmosis in AIDS. Histological and immunohistological findings based on 80 autopsy cases. Pathol Res Pract. 1993 May. 189(4):428-36. [Medline]. Weiss LM, Chen YY, Berry GJ, Strickler JG, Dorfman RF, Warnke RA. Infrequent detection of Toxoplasma gondii genome in toxoplasmic lymphadenitis: a polymerase chain reaction study. Hum Pathol. 1992 Feb. 23(2):154-8. [Medline]. Schnitzer B. The reactive lymphadenopathies. Knowles DM, ed. 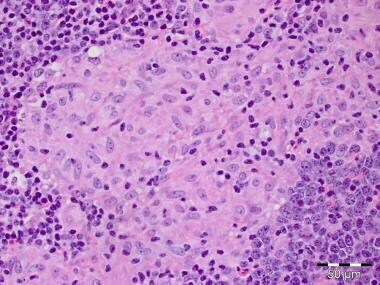 Neoplastic Hematopathology. 2nd ed. Philadelphia, Pa: Lippincott Williams & Wilkins; 2001. 537-68.